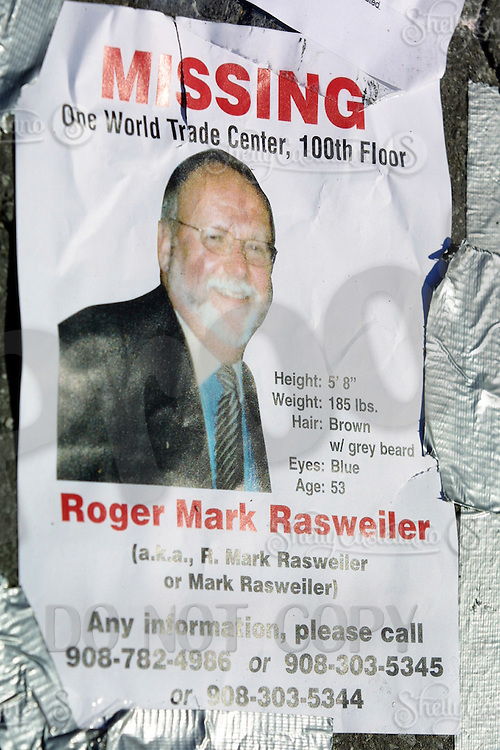 13 September 2001: Missing Person flyer of Roger Mark Rasweiler on the 100th floor of the One World Trade Center. Thousands of people were missing following the Terrorist attack on the America's. Lower Manhattan, NY. Area surrounding ground zero where the World Trade Centers WTC once stood only hours after they fell to the ground in New York. Islamic terrorist Osama bin Laden declares The Jihad or Holy War against The United States of America on September 11, 2001. Headline news photos available for editorial use.